As devastating as the loss of a loved one is, dealing with death is a part of life. Failing to acknowledge or plan for your own eventual passing does not mean it is not going to happen, it simply shifts the burden to your surviving family members. Estate planning regarding end-of-life arrangements can help to ease the blow for them, while putting any fears you may have into the proper perspective. Death tends to be one of those taboo topics, and thinking or talking about it may seem morbid or fill us with dread. Even if we are open to acknowledging the fact of our own or a loved one’s death, family members and friends may try to either stifle these conversations, or reassure us that we will ‘outlive’ them all. 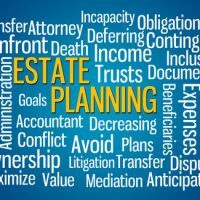 The fact is, facing your fears can have a positive impact, and estate planning provides the perfect framework for addressing the issue. The location of your will, along with the name and contact information for the person you have chosen to act as administrator. The location of any safe deposit boxes, along with important personal documents such as birth certificates, citizenship or military discharge papers, and marriage licenses. Important information, such as social security numbers for you and your spouse and any life insurance policies or pension benefits you may be owed. The names and contact information for family members and friends. The name and contact information for your estate planning attorney. An inventory of all your assets and debts (this will also be included in your will). Instructions for funeral home arrangements. Information to include in your obituary. Any charities you would want donations to be sent to in your name. Keep these instructions with your will, and provide copies to your attorney, your spouse, and any children or other beneficiaries you have. Options for personalizing your service, such as location, music, and flowers. To ensure your legal documents are in order and that any plans you make conform to state and local laws, call or contact Cavallo & Cavallo online and request a consultation in our Bronx or New Rochelle office.